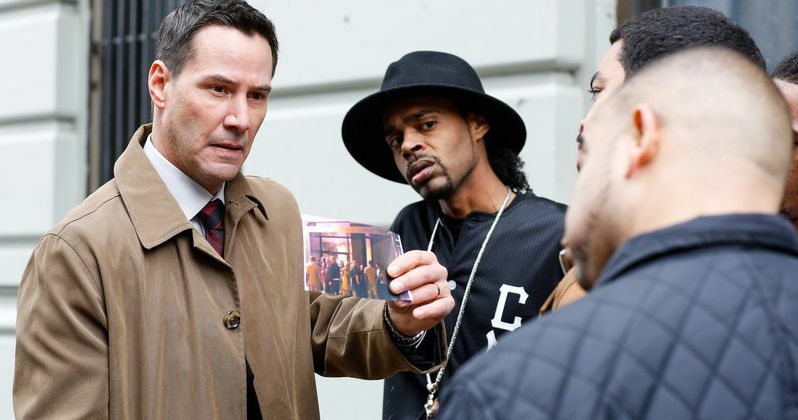 After a string of recent flops such as 47 Ronin, Generation Um... and his directorial debut Man of Tai Chi, Keanu Reeves got back on the right track last year with John Wick. The action star is currently shooting the sequel John Wick 2, but while we wait for that to hit theaters next year, Gulf Films has released the first trailer for the actor's next thriller, Exposed, along with two photos. The project doesn't have a release date at this time, but it does reunite the actor with one of his most recent co-stars. Exposed, which was previously known as Daughter of God, features Keanu Reeves starring alongside Ana de Armas once again, his co-star from the thriller Knock Knock, which hit theaters last month. The actor portrays Detective Scott Galban, who has been searching for the truth behind his partner's death. He encounters a young woman (Ana de Armas) who has experienced a miracle, and may have the answers he's looking for. Mira Sorvino, Christopher McDonald, Laura Gómez, Ismael Cruz, Danny Hoch, Jeanette Dilone, Brianne Berkson and Big Daddy Kane co-star in this thriller. The project doesn't have domestic distribution lined up, so we're not sure when it may hit theaters quite yet. It seems likely that Exposed will hit theaters sometime next year, but we won't know for sure until a studio picks up the distribution rights. Exposed was written and directed by Gee Malik Linton, who makes his writing and directing debut on this project. Before stepping behind the camera, Gee Malik Linton served as a personal trainer, working with Tobey Maguire on the original Spider-Man, Leonardo DiCaprio during The Departed and Anne Hathaway on The Dark Knight Rises. Keanu Reeves also serves as a producer alongside the writer-director and Robin Gurland, with Cassian Elwes, Randall Emmett and George Furla serving as executive producers. Keanu Reeves also has The Neon Demon, The Bad Batch and The Whole Truth hitting theaters next year, and he is attached to star in Replicas, which is currently in pre-production. We'll be sure to keep you posted with more on Exposed as soon as we have more information about the release date or the distributor. Until then, take a look at the first trailer and photos for Exposed below.